Shampoos are typically viscous liquids, either clear or opaque (pearlised), containing 20–40% solids, adjusted to approximately pH 5.5. Most, but not all, have viscosities in the ratio of 500–1500 centipoise. A hair shampoo may be defined as a detergent specifically formulated for the washing of hair, and packaged in a user-convenient form. Typically, a shampoo must clean well, rinse easily, impart gloss to the hair, minimise tangle and not damage the hair structure, or the scalp or the eyes. Shampoos are manufactured by simple slow blending in a stirred vessel. The vessel may be jacketed for heating. The shampoo manufacturing plant vessels are normally closed type and subjected to vacuum to avoid excessive foaming when foaming agent is added. For best results contra type rotating stirrer is best used for shampoo manufacturing. Ingredients are weighed or metered incrementally into the mixing vessel, with thorough mixing between each addition. A moderate amount of heat is used to reduce the viscosity and so facilitate ease of mixing. of this vessel is 60 % the capcity of the main manufacturing vessel. Premix vessels can be 1 no or 2 nos as per the clients requirements and formulae of the shampoo. In manufacturing of shampoos the SLES/ surfactants form a major ingredients. Hence it has to be stored in large quantities. Also if drums of 200 kgs are bought it will turn expensive for the manufacturers. Hence most of the manufacturers but one entire tanker of surfactants and store the same. Normally one weeks/ months usage of surfactants are normally kept stored to ensure continous production. Hence the capacity of this storage tank will be taking into consideration of the storage requirements of the client. This tanks are vertical tanks with big heights with flat bottom. Top is also closed with suitable manhole and nozzles for effective loading into the vessel through pumps. Similarly outlet is also provided at the bottom where the surfactants are tansfered from the storage vessel into the manufacturing vessel or premix vessel through pumps. 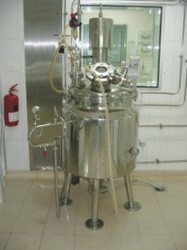 From storage vessel to filling machine. Interconnecting pipeline is provided for the plant as per the layout of the clients room size. All pipelines are electropolished from inside and outside. All joints are DIN standards quick openable types. Pipelines are used for transferring the surfactants from storage tank to premix vessels, from premix vessels to manufacturing vessels and from mfg vessels to storage vessel and from storage to filling line. Shampoo Processing Plant finds application in Lotions, Shampoo, Liquid Soap, Oral Medicine, Syrup Plant. For best results contra type rotating stirrer is best used for shampoo manufacturing.